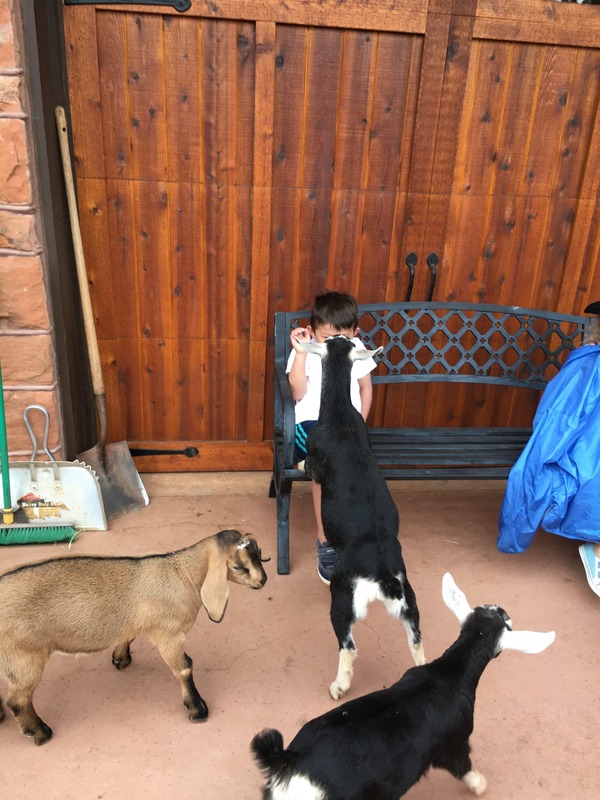 Animals bring the best out in children. Wonder, imagination, responsibility, joy, surprise, knowledge and love among other things. 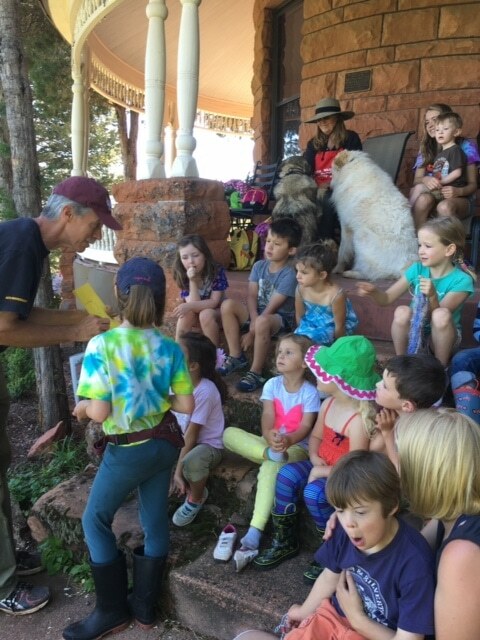 A heartfelt thank to Gail and Dan Stuart for sharing their Redstone Castle “Farm” with Ruth Washburn children this summer. Enjoy these photos from Farm Camp! “Open” and “Closed” and other signs for the office (these can be made by children). Clipboard with a checklist and blank paper for writing prescriptions. Doctor’s Kits with stethoscopes, aspirators and blood pressure gauges. Real bandages and gauze. 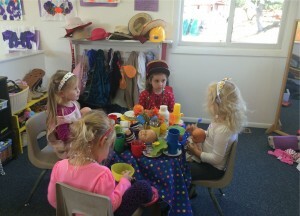 Children love to bandage dolls, stuffed animals, themselves, friends and willing adults. 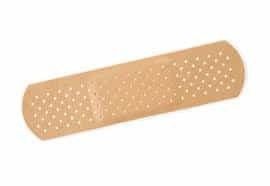 Facial tissues, tape, scraps of fabric and bandanas are other materials that can be used for bandaging. A couch, long pillow or sheet on the floor works too. Health and Human Body Books. The 610 section of your library will have many non-fiction books from which to choose. Don’t miss Tedd Arnold’s three humorous books, Parts, More Parts, and Even More Parts. Children seem to love these. Thanks to the good imaginations of the children in the classroom, we improvise when it comes to props that we don’t have. Check out Haleyn’s makeshift crutches in the photo! From my experience every child has something to say about a time he or she was hurt or when he/she visited the doctor. The pretend pediatric hospital is the perfect setting in which a parent can talk to a child about doctor visits, injuries and/or the importance of good health. I’m all for simple. 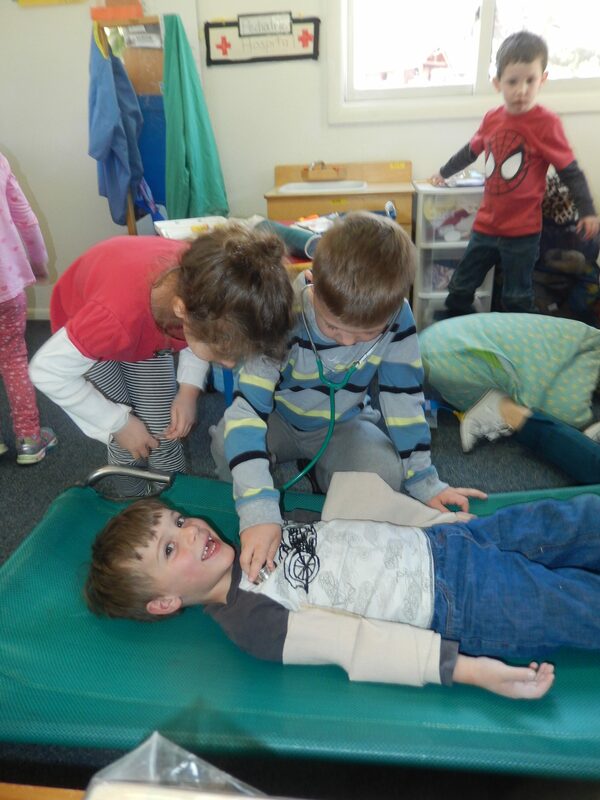 While we have all many great props at our school for our pediatric hospital, all you need at home is a couch and four or five real bandages to inspire opportunities for role play. Next time you are feeling exhausted, give your child four or five real bandages, lie down on the couch and tell your child that you need a doctor or a nurse! Let your child take care of you for a change. Well timed moans and groans and newly “hurting” body parts while acting as pretend patient can extend the play. If only you can keep from snoozing I’m pretty sure you are in for some fun! 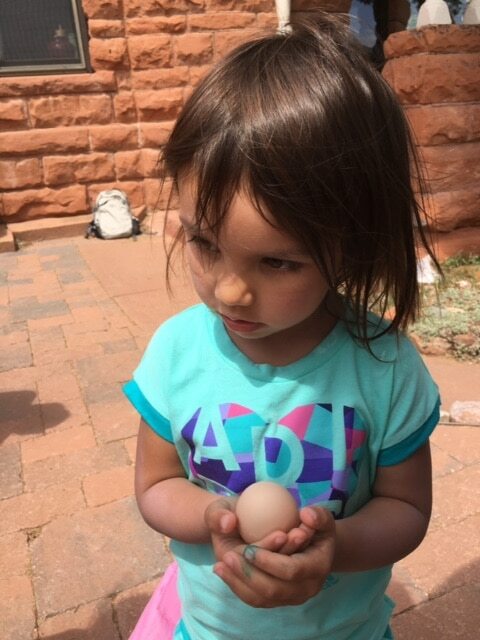 These spring days remind me of Ava’s dad, Kevin, who as parent helper spent an entire outdoor play time pitching balls to the Older 4 children. Kevin instinctively understood how to pitch so that each child holding the plastic bat had success. 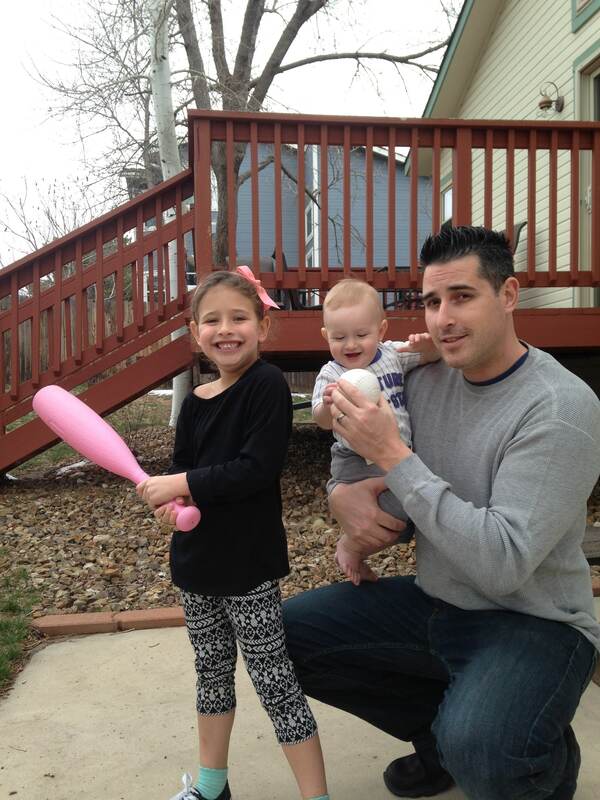 For the children who already knew how to hold a bat and swing, Kevin took several steps back and pitched strikes. These children didn’t mind missing a few tosses. Kevin would pitch to them until they got a hit. For those children who didn’t know how to hold a bat, Kevin would model a stance and grip. He would pitch from close enough so that these children also made contact with the ball. A hit! And for the children for whom swinging a bat didn’t come naturally, Kevin basically aimed his pitch so that it would hit the bat wherever the bat happened to be. Once again, success! 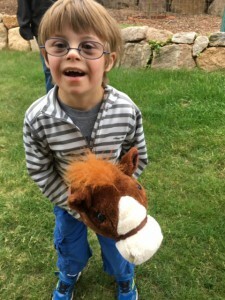 Kevin kindly responded to a child’s request to play. He welcomed both boys and girls. Kevin pitched until the last child tired of the activity. All children participating had great fun playing “baseball” and eagerly waited for his or her time at bat. No one worried about rules or the formal game of baseball. 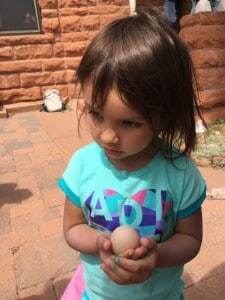 Ann Epstein in The Intentional Teacher writes “the development of these fundamental manipulative skills (including catching/collecting) is critical for children’s later participation in sports and games. Because some involve interacting with others, their mastery also opens a world of social relationships.” Kevin offered a perfect age-appropriate practice session! For learning the “catch” part of baseball, I recommend beginning by tossing a large stuffed animal back and forth with a young child. This game can be varied by increasing the distance between you and your child. Once he or she gets good at this, try some high throws, or throws to the right or left. And eventually you can work your way to playing catch with a ball. If you are lucky enough to have a child with a great imagination, use a winter glove for a mitt. Kevin’s daughter Ava is now in kindergarten. We miss her but look forward to Kevin, his wife Amanda and their one-year-old slugger George at the school in the future. Thank you Kevin. It’s Not A Cardboard Box. It’s a….flying tent, an elevator, a book shelf, a doll’s bed, a race car called “Thunderbolt,” a playhouse, a hospital, an airplane. 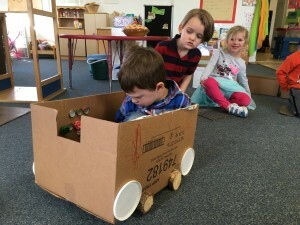 It’s a process to give a child a plain and simple cardboard box and offer him/her the opportunity to use planning, imaginative, artistic and building skills to create his/her very own box project. The steps are simple for facilitating this activity. Find an empty box, preferably one without writing and graphics leaving plenty of space for children’s decorations. A box big enough for the child to sit in is especially fun. Brainstorm with your child some of the things the box could potentially become. 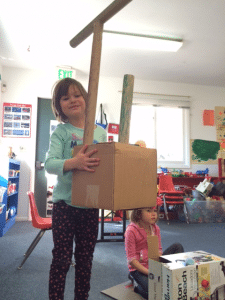 By rotating the box into different positions you and your child can come up with a variety of possibilities. A jack-in-the-box, a vending machine, a pet’s cage, a cave, a table, a garbage truck and so on. During this brainstorming session, show your child a variety of ways you can support this project. An adult can cut a door, window, circle, coin slot, skylight, windshield or whatever might need cutting. Fabric scraps can be supplied for possible use as carpeting, curtains, wallpaper, cushions, blankets, and more. A supply of recycled items including plates, plastic lids, aluminum foil, colored paper and old CDs can be glued on as buttons, wheels, house siding , dashboards and other uses dreamed by a child. 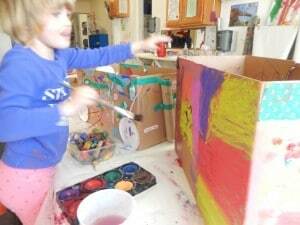 Paint, markers, crayons and colored pencils can add details and “finishing touches” to the box. Give the child the box and support him/her with what he/she needs from you. Sometimes it’s as easy as cutting open a door or helping with glue. Children may want you want you to write a name or number on the box. I encourage children to do as much independently as they can. Finally, enjoy watching a creative process at work. Your child will bring ideas and a plan to the project demonstrating his/her ability to think symbolically. And they will work to make their plan a reality. “Tell me what you need,” “tell me about your plan,” and “tell me about your box” are perfect questions to support your child throughout the process. 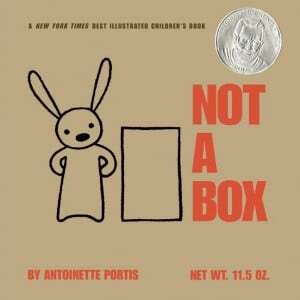 Your children will enjoy reading the book It’s Not A Box, by Antoinette Portis before, during and after the process of making his/her own cardboard box project. Both the book and the activity are celebrations of children’s imaginations. 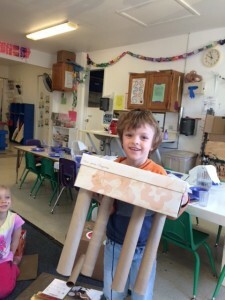 I’d love to hear about your child’s cardboard box creation. 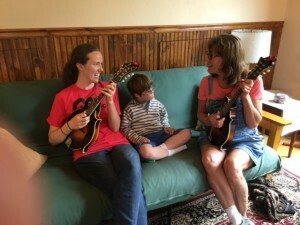 I have always loved an article written by environmentalist Rachel Carson entitled, “Help Your Child to Wonder” which tells about how Ms. Carson shared the beauty and mystery of life with her nephew. The article inspired our family to take “night walks” each year in December (these are some of my children’s fondest memories from childhood) and make visits throughout the year to a shallow stream where bridge building, stick floating and river watercolor painting happened in a spontaneous way. Rachel Carson’s gift of a magnifying glass to her nephew broadened my thinking about age-appropriate gifts for children. Small tackle boxes for collecting natural treasures, folding shovels that invited digging projects, flashlights for indoor and outdoor exploration and a simple pulley and rope set were gifts that encouraged involvement in the natural world. If you are wondering about outdoor education at Ruth Washburn, please join us on January 21 at 6:00 PM in Minnow’s Room for a presentation and discussion about Outdoors 4s and 5s, a new class that will be offered in the fall. 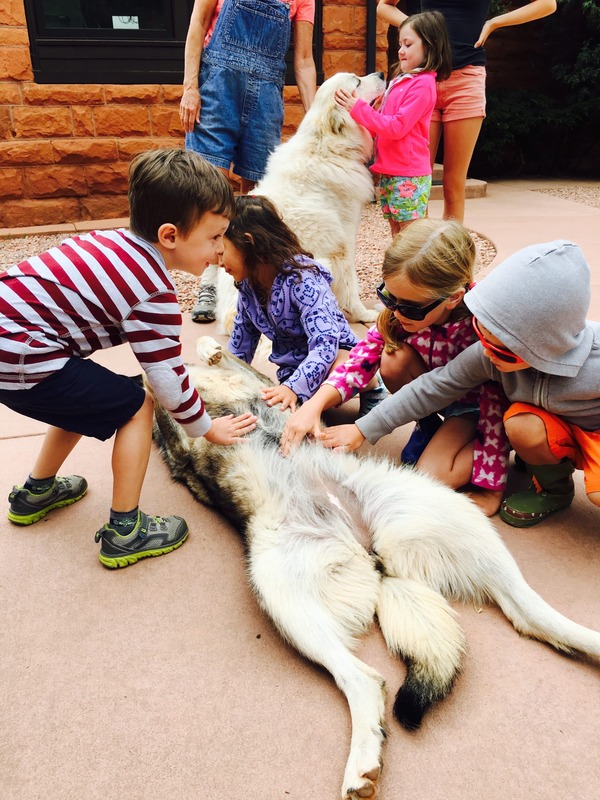 We would love to hear your thoughts about sharing the outdoors with young children. Please welcome guest blogger Kristin Maida. Kristi teaches the Morning Mixed Age class. 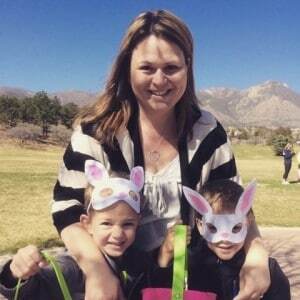 She is the mother of two Ruth Washburn graduates, Joey and Cole. 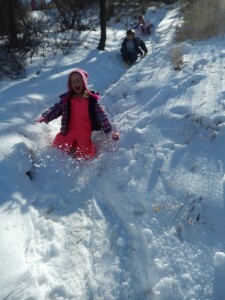 You may look forward to cold days when you read some of her great ideas for indoor play! Set up an indoor obstacle course. It can include things like walking around the table three times or jumping on a tile square four times. Chairs and masking tape will be your friends! Paper airplane relays. Try to use various types of folds, paper and heights to race those planes across your home. Decorating a paper airplane can be fun, too. Binocular Scavenger Hunt. Don’t spend a ton of money, but binoculars are sure fun for kids to play with! Look out the window and try to vary the items to be found. For example: Find a tiny tree with six leaves. Your neighbors might think you’re nosy, but keep in mind that they would be pretty desperate if they were trying to find ways to entertain children! Balloon Tennis or volleyball. Create a net with chairs or tape. This activity is sure to help get some of those wiggles out! Living Room Camping. Get out those dusty sleeping bags, make a tent or pitch the good old one that was used when the weather was so kind. Camping is a lot of fun, especially in the comfort of one’s living room. Mystery Box. Cut a hole in a box and put various items in the box. You can make this a clean up game or help get children interested in finding a place for various items. The children can also find items for you to guess! Lastly, if possible, go outside! Bundle up, build a snowman, sled and enjoy the white stuff around us! 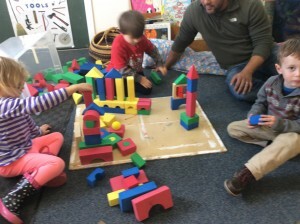 One crew made a construction site with a hemisphere shape as “a dome.” A member of this group thought long and hard about how to use the curve shaped blocks. 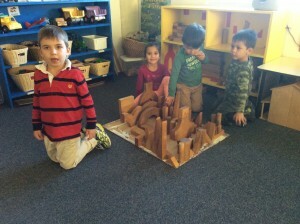 Eventually he created a road to the site with C-shaped blocks and a ramp. 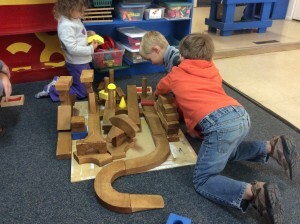 Four children used block shapes to build a water park. Triangular blocks were positioned upright as water slides and columns sprayed water. One child built a pyramid into his structure to make a tower. Another opted to build a house. 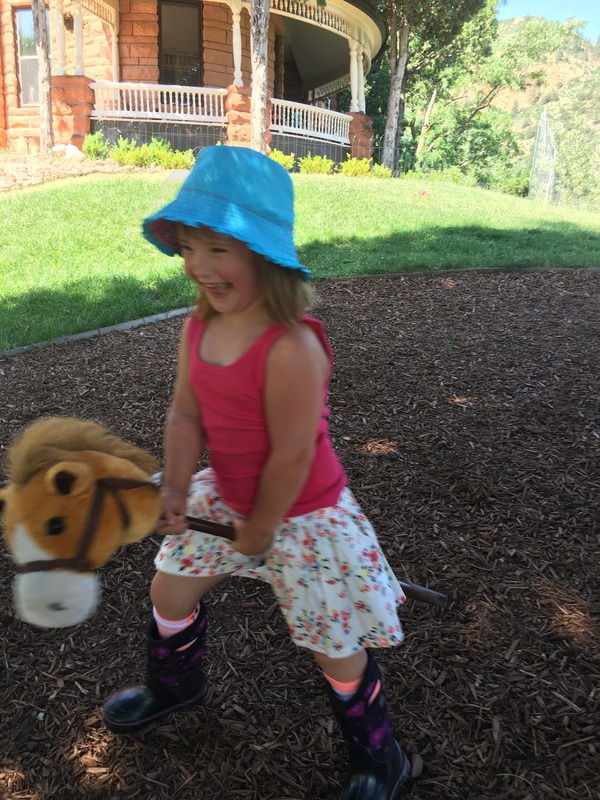 She persevered when her first attempt toppled over and built a second. The third child working in this area experimented with arches. 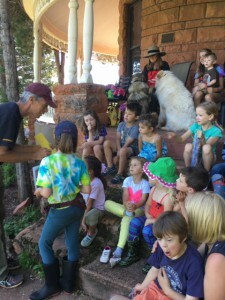 All the children engaged in an impromptu show-and-tell. As we walked to see the three different areas where children worked, each individual child had something he/she wanted to say about their creation. When it came time to clean up the blocks, groups worked as teams matching block with shape outlines on the shelves— a puzzle in itself. There is no shortage on research about the benefits to block play. 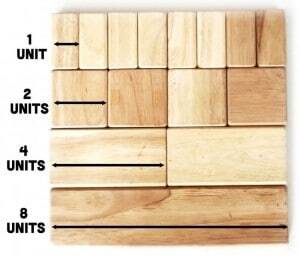 This excerpt from The Economist magazine in the article “How do unit blocks help children learn?” nicely summarizes the benefits of block play and what is meant by “unit” blocks. How can I forget about blocks? Special thanks to teacher Brenda Holmes-Stanciu who helps me remember! Sukie Jackson Older 4s teacher. I have some investment advice for you. Invest in an apple peeler while your children are young. This is not your normal investment advice, I admit, but our family has gotten so much use out of our peeler over the years, that I thought I’d better pass the secret along. Why invest in an apple peeler? An apple is a nutritious food. As a Ruth Washburn parent I was so positively influenced by the school’s healthy snack policy, Snack Time At Ruth Washburn, that for all the years that my three children were in elementary school, I supplied apples and our apple peeler for holiday and birthday parties. Serving peeled, sliced apples sprinkled with cinnamon on decorative napkins was an easy, healthy alternative to cupcakes. We have taken the peeler to athletic events, dinner parties, birthdays and pot-lucks. 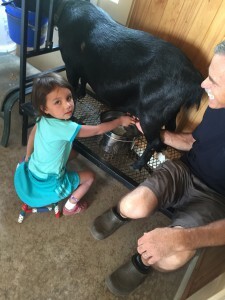 Everybody likes having a turn (literally a turn of the crank!). And everybody enjoys the resulting apple snack. Introduce different apple varieties which have names with such personality—Granny Smith, Pink Lady, Jonathan, Gala and Honey Crisp. Compare tastes of different varieties and and have children pick favorites. Observe what is the same and what is different about apple varieties. Excavate an apple half using a popsicle stick as a tool. Children can discover the stem, the core, the skin and count the number of seeds in their apple. Cut an apple in half horizontally to discover the star. 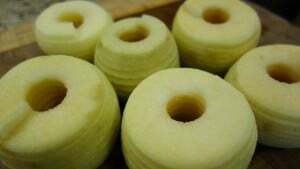 Blend and cook apples to make applesauce. While most children enjoy operating an apple peeler, there are some children who are curious about how this tool works. 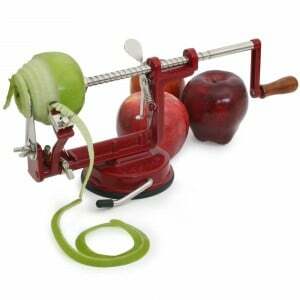 Educational websites describe an apple peeler as a compound machine. 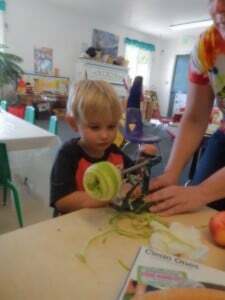 “Four different simple machines make up an apple peeler. The handle is a wheel and axle. The axle is also a screw that turns the apple. A wedge peels the apple’s skin. To hold the machine in place, a lever can be switched to engage a suction cup.” What a fantastic teaching tool! An apple peeler makes a unique, durable gift. 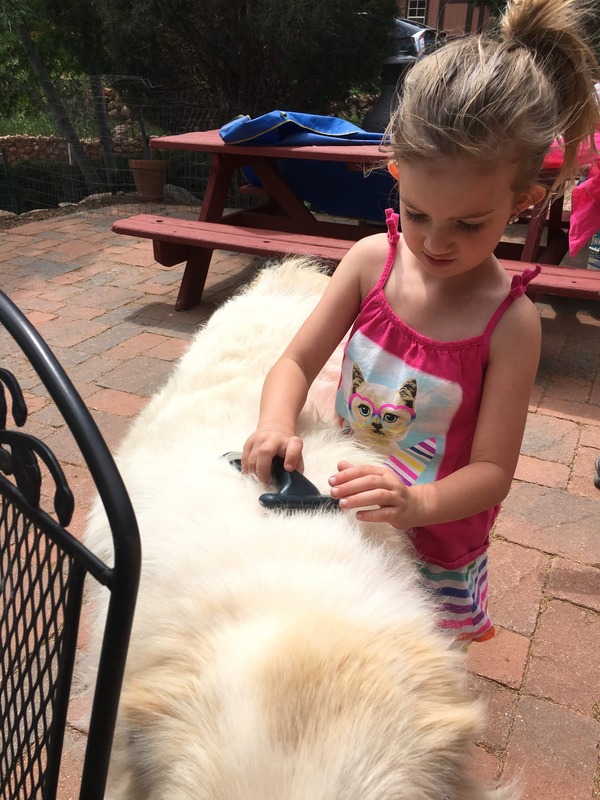 Children of all ages love peeling, coring, slicing…. and best of all eating apples. So invest now, and let us know what you like best about having your own apple peeler. One cold September morning my four-year-old daughter Kimi had nothing to do. Her older siblings were happily occupied and I was happily reading. “Mom, there’s nothing to do,” Kimi said more than once. I now know from experience that some of the best activities and ideas can come out of a time when there is “nothing to do.” This was one of those times. 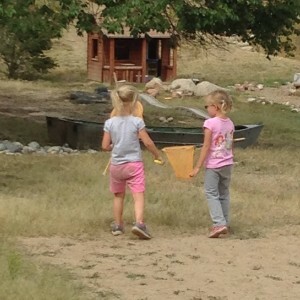 Kimi came up with the idea herself to make a May Day basket. Her brother and sister thought this plan was hilarious due to the cold weather and the fact that it was September. That didn’t stop Kimi from getting large piece of pink construction paper. I helped to make a cone shape for the basket. She cut a paper strip for a handle and pushed the stapler to connect it to the basket. Kimi put on her jacket, I got mine and outside we went. Still wishing I was back inside reading, I couldn’t help but notice how how good the cold wind felt. My daughter made me laugh seeing her outside with her pink May Day basket. I sat on the steps and watched as she picked dried mint, pine needles, some of the last crab apples, pine cones and oregano. Back inside Kimi showed her basket to her brother and sister who complimented her on the colors and the good smelling mint. 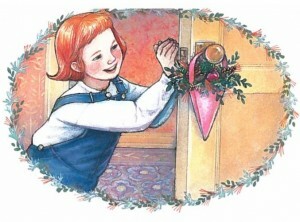 She proudly hung it on her bedroom door knob and we decided to call it a September-May Day basket. I remember this day fondly. 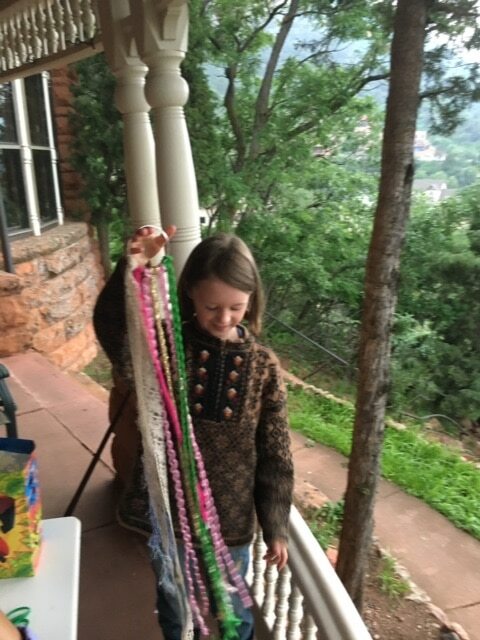 I felt grateful that my daughter reminded me of the wonder, beauty and excitement in my own life with the activity of making a September May Day basket with her. I will be the first to admit that not every time Kimi was “bored” (how do they learn that word so young?) or with nothing to do resulted in such a creative, constructive activity. But many times it did. I was delighted to support her efforts to help herself with her bored, nothing-to-do state. 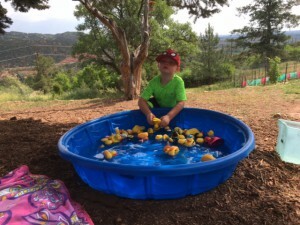 In our Ruth Washburn garden, so lovingly tended for by Cecelia and the Garden Committee, Ruth Washburn is the perfect place for children to enjoy the opportunity to explore and gather treasures making September-May Day baskets. Give it a try at home or in a local park and send us a picture of your version of a September May-Day basket! Note— Illustration by Karen Dugan from September-May Day Basket in Ladybug Magazine. 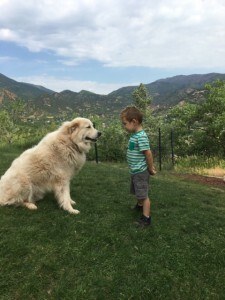 While remodeling a bedroom in preparation for the arrival of our second child, I spent many afternoons in hardware stores with lists of tools and materials to buy. Often, my two-year-old son, Kenji, was with me. It was his fascination with nails, tools, pipes, wood, chains and just about everything else there that started me purchasing hardware toys. What I liked about these hardware-store toys is they helped us to make our son a part of our everyday life. Each tool has a real purpose, and he could see what we did with tools to fix, clean, change or build. Like all parents, I am concerned about the safety of toys. I made sure to be in the same room or outside area supervising Kenji when he used these tools. 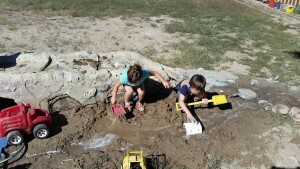 I appreciated their durability and the many creative uses my son found for each one. Although Kenji is a boy, I heartily recommend hardware toys for girls as well. These toys help children of both sexes become comfortable with tools from an early age and help them feel confident and independent. 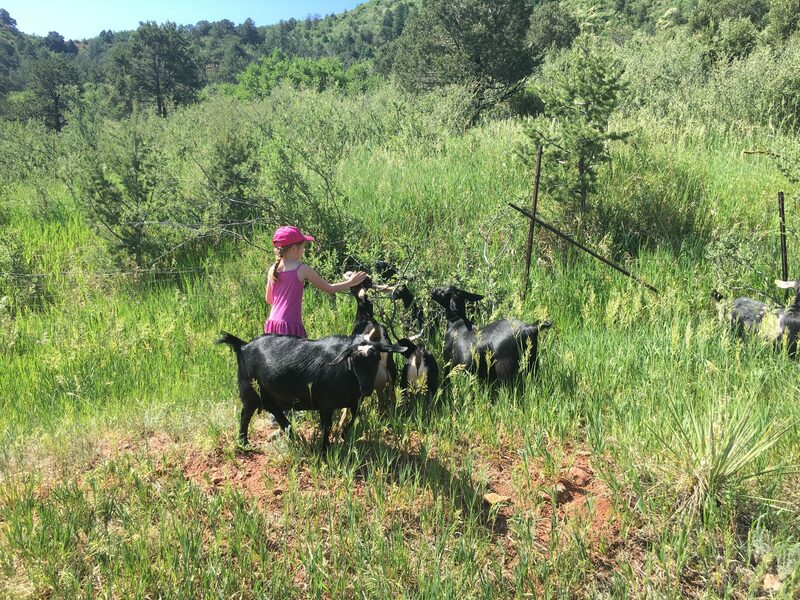 In the same way that including children in work projects at home provides learning opportunities, Ruth Washburn Maintenance Days offer children the chance to watch, work and play alongside adults using a variety of tools for the real purpose of readying the school for classes. 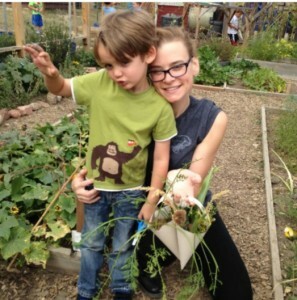 The learning has already begun when children can see their parents model volunteering, a caring for the school environment and skills as they clean, fix and build. RW graduate Kenji is now twenty-six years old. Playing with tools as a child prepared him well for his current tools, an otoscope and stethoscope. In his training to become a pediatrician Kenji’s first year medical school advisor just happened to be another RW graduate, Dr. Ben Scott.